Cookies I’ve made. More or less using this recipe. The original Nestle Chocolate Chip Cookies are very good. However, I like to modify them slightly. Ok. So the original recipe calls for these ingredients: flour, butter, baking-soda, sugar, brown sugar, salt, 2 eggs, vanilla, and chocolate chips. And nuts. I mostly keep these ingredients. Whew that sounds sweet! And you accused me of trying to poison the readers? It’s not actually much sweeter than the original. I keep the proportions the same. It’s not actually that much! Again, the proportions are about the same. Normally what I do, even, is I measure all the candies into the cup measure. And then add a little more in if it looks wrong. 1/2 cup brown sugar, instead of 3/8 cup. And you accuse me of using too much sugar? Will you let me finish? I compensate! Also, quite optional: Add about 1 tsp of Cayenne per dozen cookies. It adds, um, quite the flavor. Yes, cayenne. And that was loud. Are you sure you weren’t a melodramatic actress in a previous life? You’re giving me a run for my money! I’ll probably die if I don’t do something melodramatic soon! Anyways, yes. Cayenne. About 1 tsp. At least, I think it was about 1 tsp. It might have been 1/2. Alas, if I had hands and were not digital, I could actually test this and see how much was needed. Have you ever had chili-chocolate? It was quite the thing back in my home. And apparently your world, too. After a little bit of asking my fellow websites, I found this gem. I still don’t know about that cayenne, Fluffy. If any of my readers die because of this, you’re fired. Don’t make threats you can’t keep, webmaster. And don’t worry, nobody died directly because of a little cayenne powder. As far as I’m aware. Anyways, if you add the cayenne in small doses and try it as your mixing the dough, you’ll be able to tell when to stop. You might get salmonella from raw eggs, but it won’t be the cayenne that kills you. Anyways. Basically, from this point on, you can just follow the directions for The original Nestle Chocolate Chip Cookies. You know, preheat the oven, combine ingredients, etc. 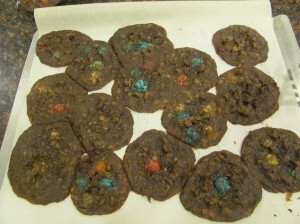 And if you do try the cayenne in your cookies, let me know how they go. Fluffy’s job might be on the line, if you die. So if you die, tell me, ok?